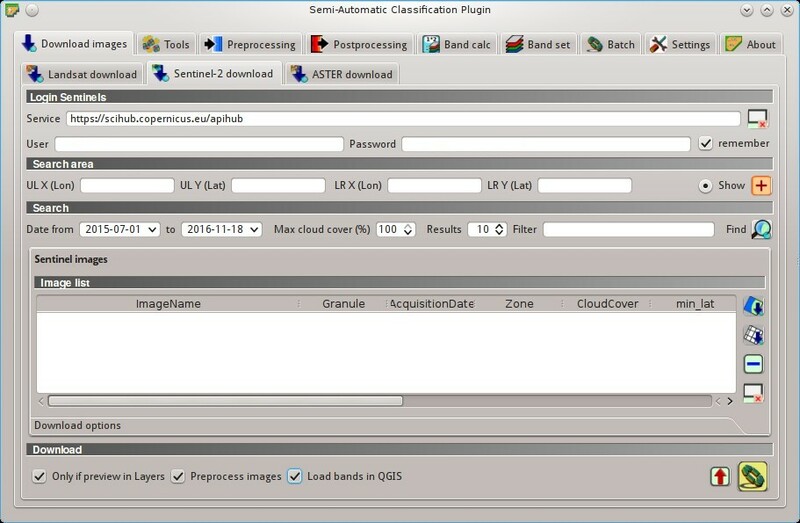 The tab Download images includes the tools for searching and downloading free remote sensing images. An internet connection is required. This tab allows for searching and downloading the whole archive of Landsat Satellite images (from 1 MSS to 8 OLI), acquired from the 80s to present days. Search is performed through the CMR Search API developed by NASA. Landsat images are freely available through the services: EarthExplorer , Google Earth Engine , and the Amazon Web Services (AWS) (for Landsat 8). This tool attempts to download images first from Amazon Web Services and Google Earth Engine ; only if images are not available, the download is performed through the service EarthExplorer in order to prevent the server from becoming saturated. Images are downloaded as compressed archives (this tool allows for the download of single bands for Landsat 8 images provided by the Amazon Web Services ). 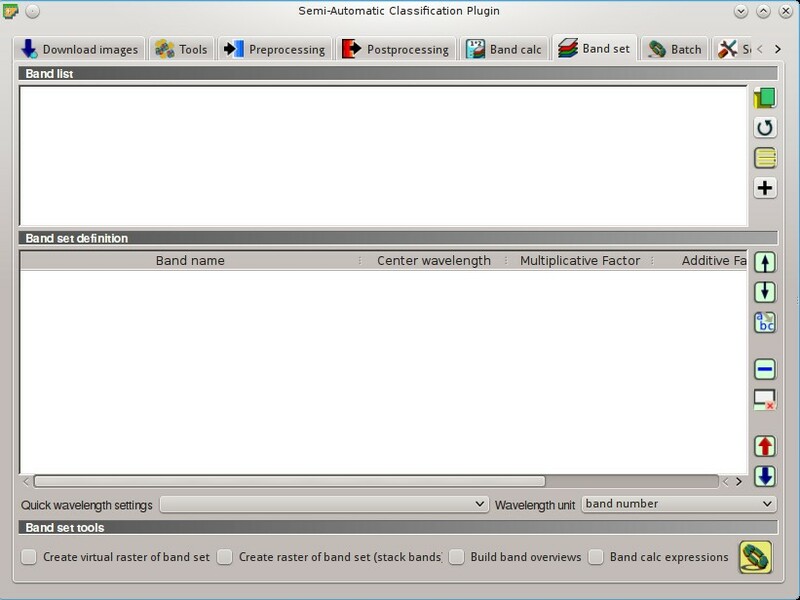 Also, automatic conversion to reflectance of downloaded bands is available. USGS EROS credentials (https://ers.cr.usgs.gov) are required for downloads from EarthExplorer . Login using your USGS EROS credentials or register for free at https://ers.cr.usgs.gov/register . Define the search area by entering the coordinates (longitude and latitude) of an Upper Left (UL) point and Lower Right (LR) point, or interactively drawing an area in the map. The definition of a search area is required before searching the images. 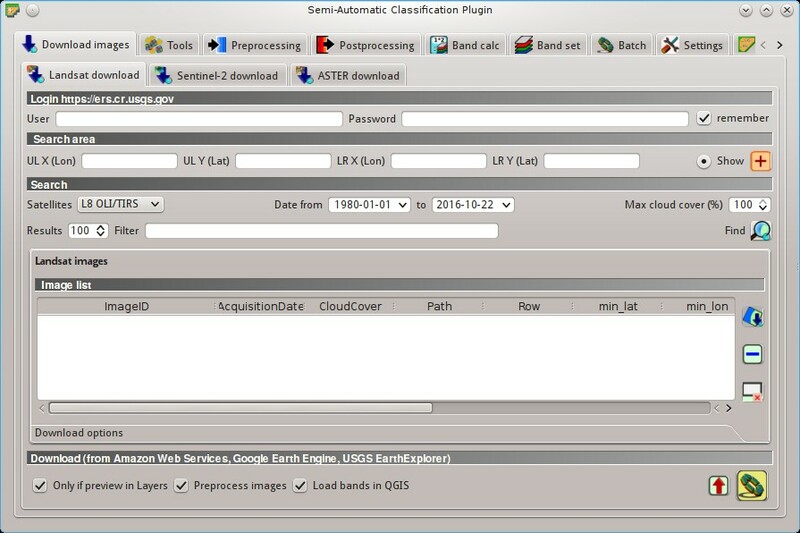 Define the search settings such as date of acquisition, maximum cloud cover, or specify Landsat satellites. Tip: Search results (and the number thereof) depend on the defined area extent and the range of dates. In order to get more results, perform multiple searches defining smaller area extent and narrow acquisition dates (from and to). 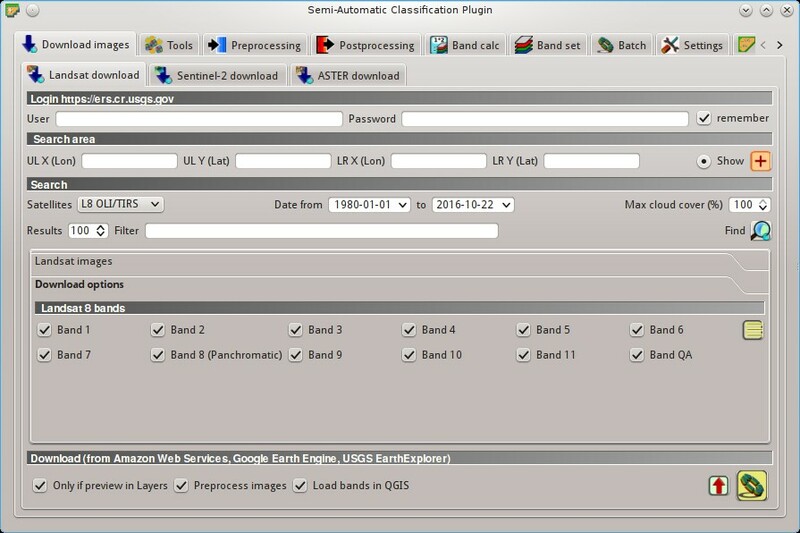 This tab allows for the selection of single bands (only for Landsat 8 images provided by the Amazon Web Services ). Download the Landsat images in the Landsat images. During the download it is recommended not to interact with QGIS. Download is performed according to image availability from the services EarthExplorer , Google Earth Engine , or the Amazon Web Services (AWS) . If the image is not available for download it is possible to check the availability thereof on http://earthexplorer.usgs.gov/ . Sentinel-2 is a European satellite launched in 2015, developed in the frame of Copernicus land monitoring services, which acquires 13 spectral bands (see Sentinel-2 Satellite). This tab allows for searching and downloading the free Sentinel-2 images (Level-1C) from the Sentinels Scientific Data Hub (using the Data Hub API ). Images are mainly downloaded from the Amazon S3 AWS if available. Sentinel-2 satellite has a swath width of 290km. Sentinel-2 Level-1C images are delivered in granules (also called tiles) with a side of 100km in UTM/WGS84 projection. This tool allows for the selection and download of granules and bands. Tip: In case of errors please see Error  ‘Internet error’. Unable to download Sentinel-2 images. Why? and Error  ‘SSL connection error’. Unable to download Sentinel-2 images. Why?. In order to access to Sentinel data a free registration is required at https://scihub.copernicus.eu/userguide/1SelfRegistration (other services may require different registrations). After the registration, enter the user name and password for accessing data. Define the search area by entering the coordinates (longitude and latitude) of an Upper Left (UL) point and Lower Right (LR) point, or interactively drawing an area in the map. The definition of a search area is required before searching the images. Define search settings such as the date of acquisition or search for specific Sentinel images using the Image ID or name. Tip: download this zip file containing the shapefile of Sentinel-2 granules for identifying the zone; load this shapefile in QGIS, select the granules in your search area and open the attribute table to see the zone name. This tab allows for the selection of single bands. Download the Sentinel-2 images in the Sentinel images. Bands selected in Download options are downloaded. During the download it is recommended not to interact with QGIS. This tab allows for searching and downloading the whole archive of free images L1T acquired by ASTER Satellite since 2000. Search is performed through the CMR Search API developed by NASA. The ASTER L1T data products are retrieved from the online Data Pool, courtesy of the NASA Land Processes Distributed Active Archive Center (LP DAAC), USGS/Earth Resources Observation and Science (EROS) Center, Sioux Falls, South Dakota, https://lpdaac.usgs.gov/data_access/data_pool. Also, automatic conversion to reflectance of downloaded bands is available. EOSDIS Earthdata credentials (https://urs.earthdata.nasa.gov ) are required for download. Login using your EOSDIS Earthdata credentials or register for free at https://urs.earthdata.nasa.gov/users/new . Define the search settings such as date of acquisition, maximum cloud cover, or specify ASTER satellites. Download the ASTER images in the ASTER images. During the download it is recommended not to interact with QGIS. This tab allows for searching and downloading the archive of free MODIS Products acquired since 2000 (in particular MOD09GQ, MYD09GQ, MOD09GA, MYD09GA, MOD09Q1, MYD09Q1, MOD09A1, MYD09A1). Search is performed through the CMR Search API developed by NASA. MODIS products are retrieved from the online Data Pool, courtesy of the NASA Land Processes Distributed Active Archive Center (LP DAAC), USGS/Earth Resources Observation and Science (EROS) Center, Sioux Falls, South Dakota, https://lpdaac.usgs.gov/data_access/data_pool. Also, automatic reprojection of downloaded bands is available. Define the search settings such as date of acquisition, maximum cloud cover, or specify MODIS product. Download the MODIS images in the MODIS images. During the download it is recommended not to interact with QGIS. 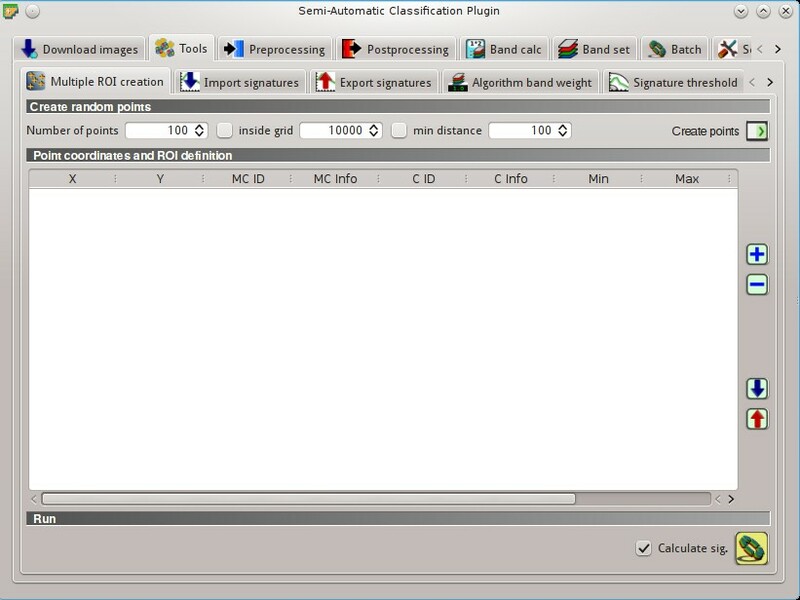 The tab Tools includes several tools for manipulating ROIs and spectral signatures. 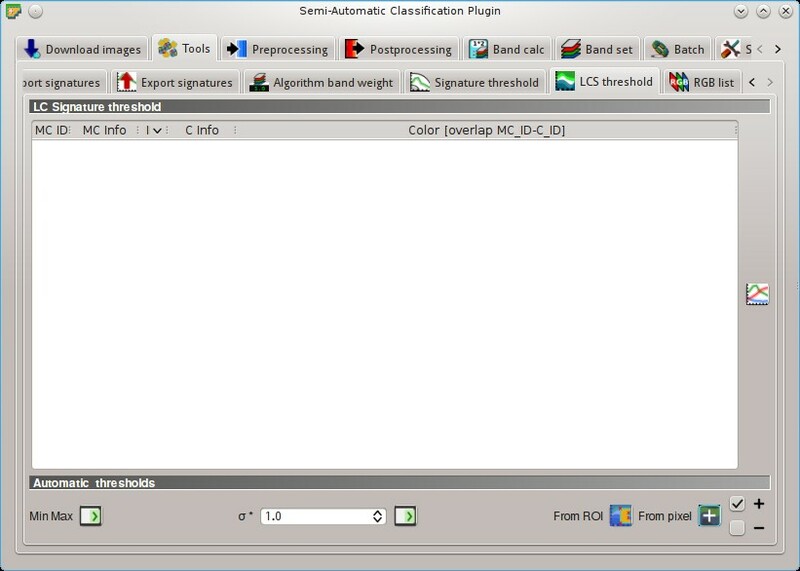 This tab allows for the automatic creation of ROIs, useful for the rapid classification of multi-temporal images, or for accuracy assessment. Given a list of point coordinates and ROI options, this tool performs the region growing of ROIs. Created ROIs are automatically saved to the Training input. 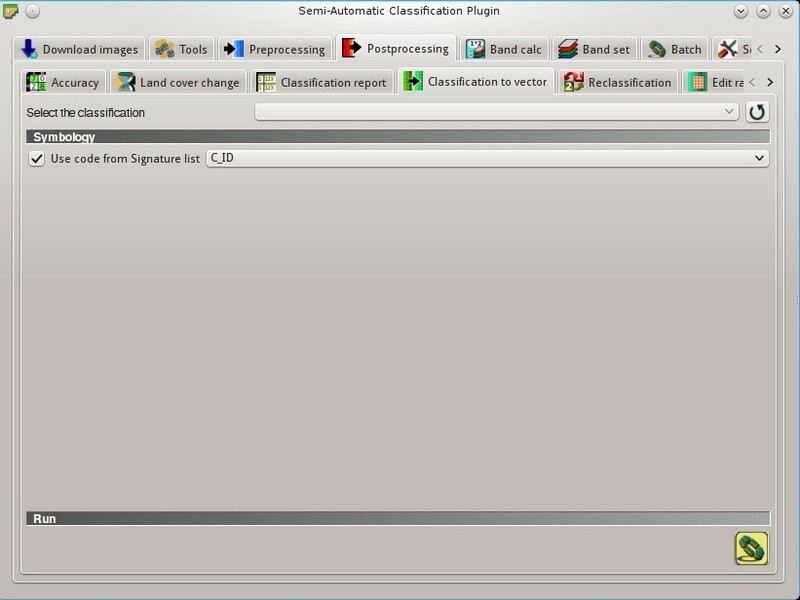 The tab Import signatures allows for importing spectral signatures from various sources. This tool allows for importing a shapefile, selecting the corresponding fields of the Training input. 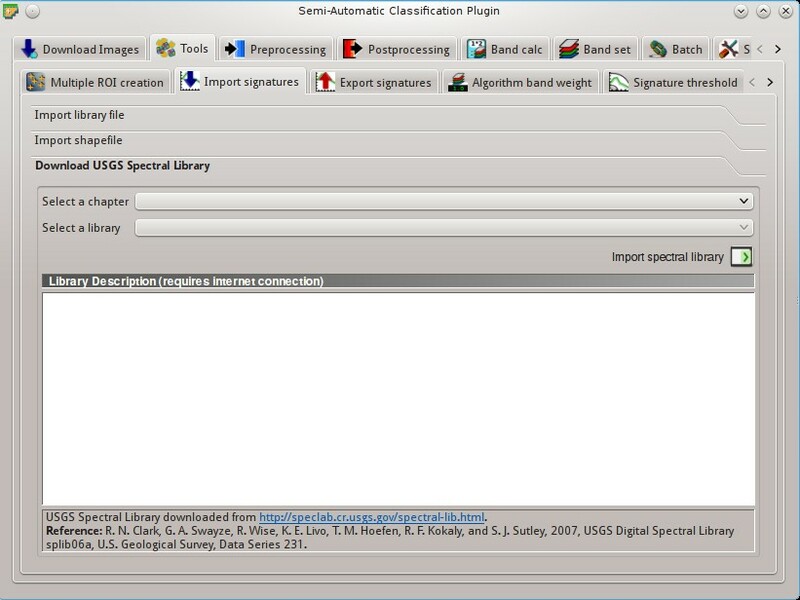 The tab Download USGS Spectral Library allows for the download of the USGS spectral library (Clark, R.N., Swayze, G.A., Wise, R., Livo, E., Hoefen, T., Kokaly, R., Sutley, S.J., 2007, USGS digital spectral library splib06a: U.S. Geological Survey, Digital Data Series 231). The libraries are grouped in chapters including Minerals, Mixtures, Coatings, Volatiles, Man-Made, Plants, Vegetation Communities, Mixtures with Vegetation, and Microorganisms. An internet connection is required. Tip: Spectral libraries downloaded from the USGS Spectral Library can be used with Minimum Distance or Spectral Angle Mapping algorithms, but not Maximum Likelihood because this algorithm needs the covariance matrix that is not included in the spectral libraries. 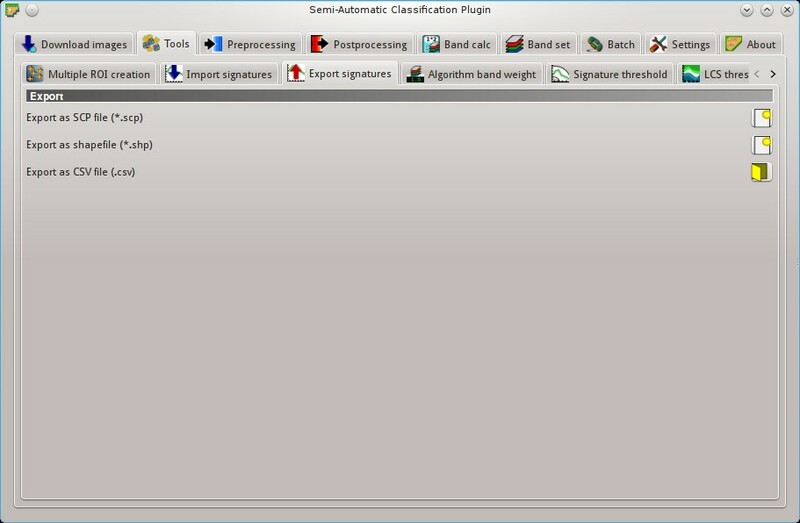 This tool allows for exporting the signatures highlighted in the ROI Signature list. 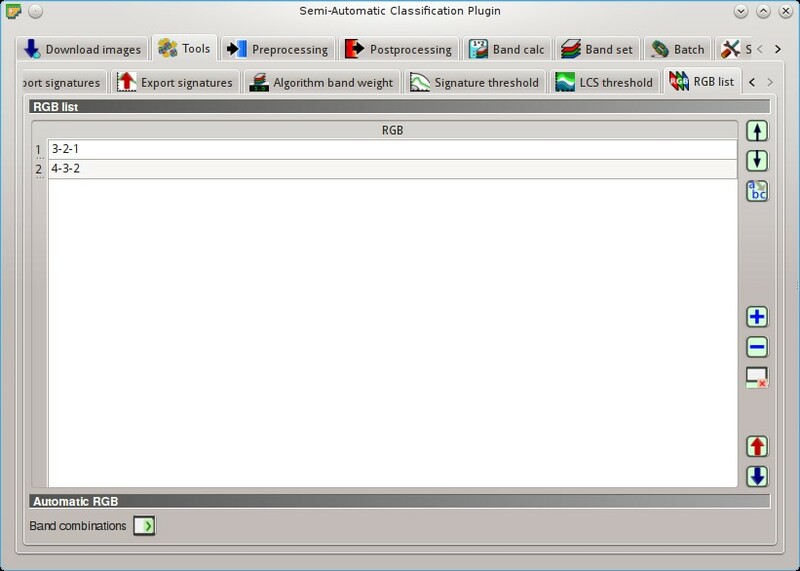 This tab allows for the definition of band weights that are useful for improving the spectral separability of materials at certain wavelengths (bands). 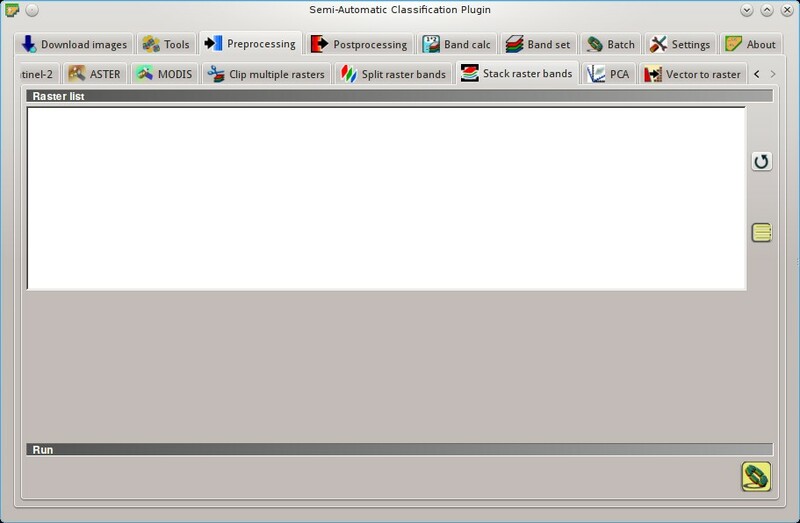 During the classification process, band values and spectral signature values are multiplied by the corresponding band weights, thus modifying the spectral distances. 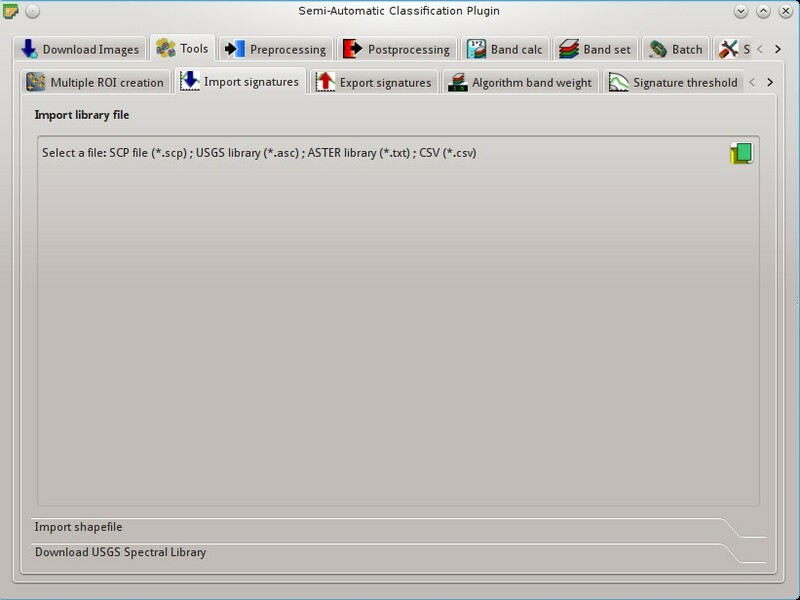 This tab allows for the definition of a classification threshold for each spectral signature. All the signatures contained in the Training input are listed. 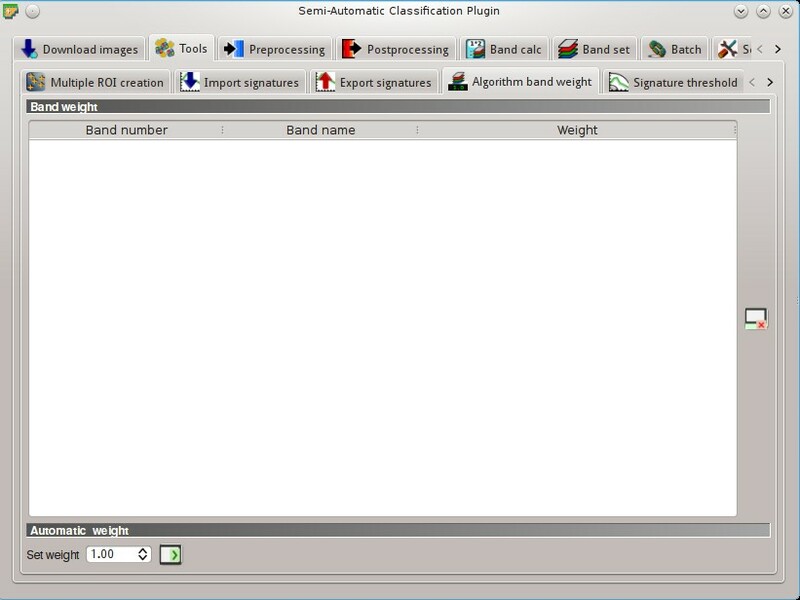 This is useful for improving the classification results, especially when spectral signatures are similar. Thresholds of signatures are saved in the Training input. for Spectral Angle Mapping, pixels are unclassified if spectral angle distance is greater than threshold value (max 90). This tab allows for setting the signature thresholds used by Land Cover Signature Classification. All the signatures contained in the Training input are listed; also, signature thresholds are saved in the Training input. 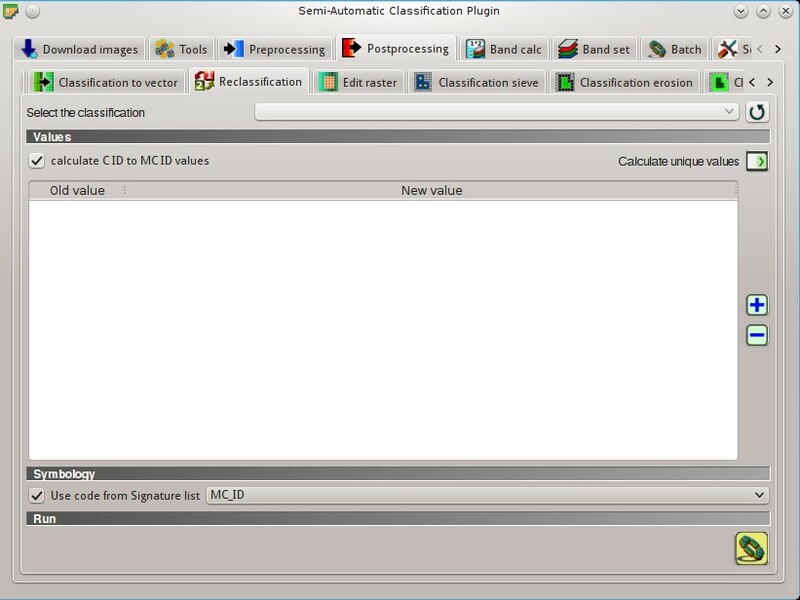 Overlapping signatures (belonging to different classes or macroclasses) are highlighted in orange in the table LC Signature threshold; the overlapping check is performed considering MC ID or C ID according to the setting Use MC ID C ID in Classification algorithm. Overlapping signatures sharing the same ID are not highlighted. Set thresholds automatically for highlighted signatures in the table LC Signature threshold; if no signature is highlighted, then the threshold is applied to all the signatures. This tab allows for managing the RGB Color Composite used in the list RGB= of the Image control. 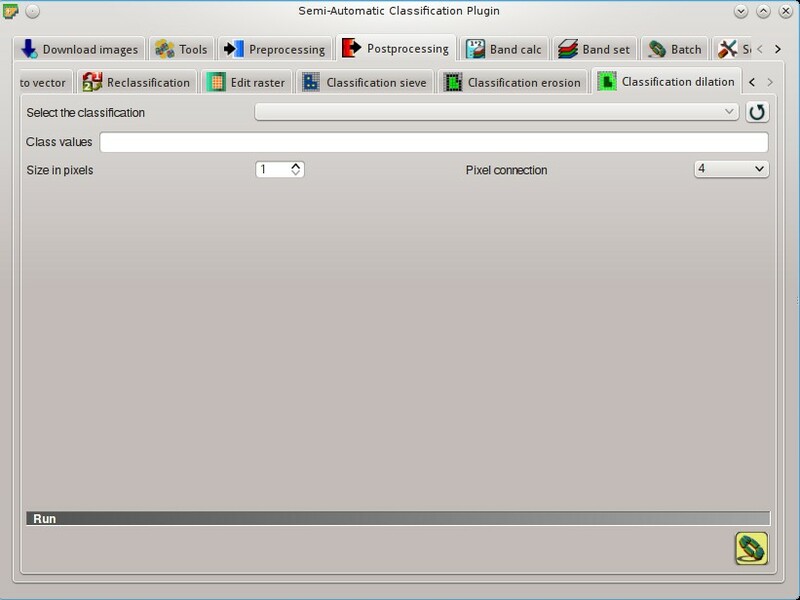 The tab Preprocessing provides several tools for data manipulation which are useful before the actual classification process. This tab allows for the conversion of Landsat 1, 2, and 3 MSS and Landsat 4, 5, 7, and 8 images from DN (i.e. Digital Numbers) to the physical measure of Top Of Atmosphere reflectance (TOA), or the application of a simple atmospheric correction using the DOS1 method (Dark Object Subtraction 1), which is an image-based technique (for more information about the Landsat conversion to TOA and DOS1 correction, see Image conversion to reflectance). Pan-sharpening is also available; for more information read Pan-sharpening. Once the input is selected, available bands are listed in the metadata table. All the bands found in the Directory containing Landsat bands are listed in the table Metadata. 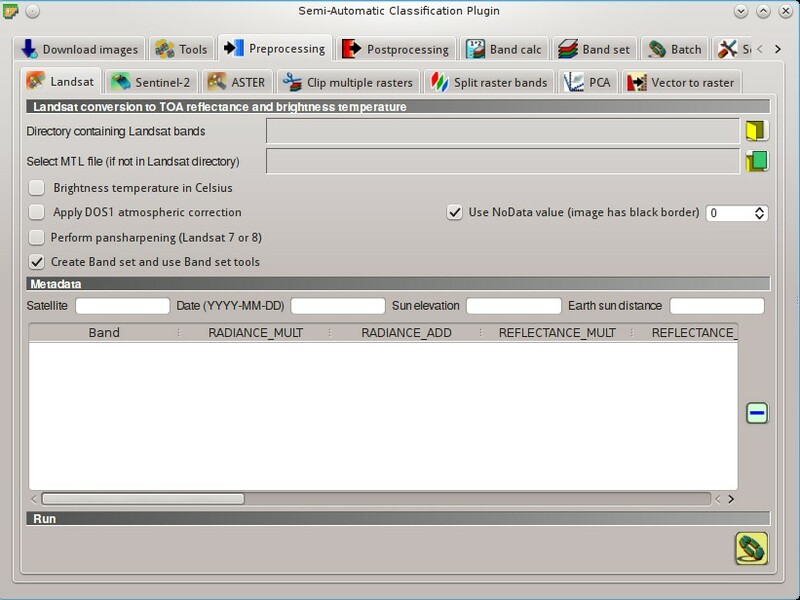 If the Landsat metadata file (a .txt or .met file with the suffix MTL) is provided, then Metadata are automatically filled. For information about Metadata fields read this page and this one . 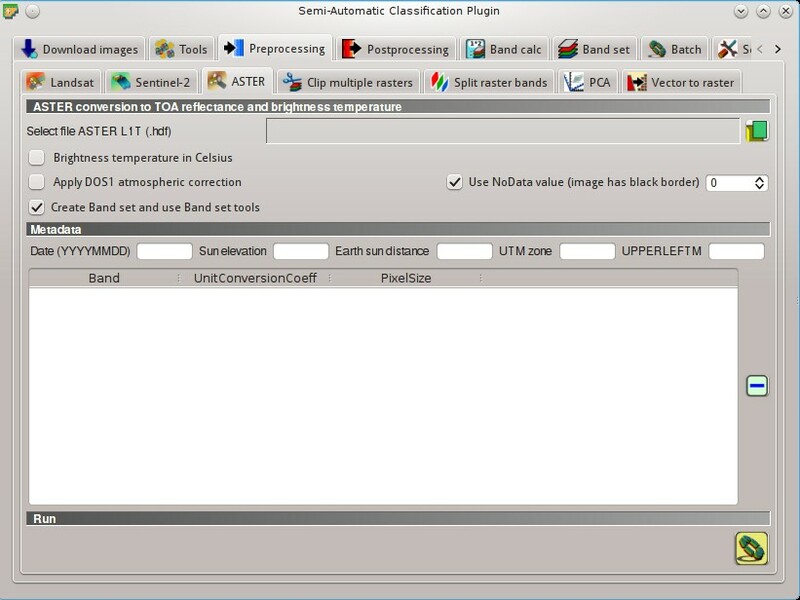 This tab allows for the conversion of Sentinel-2 images to the physical measure of Top Of Atmosphere reflectance (TOA), or the application of a simple atmospheric correction using the DOS1 method (Dark Object Subtraction 1), which is an image-based technique (for more information about conversion to TOA and DOS1 correction, see Image conversion to reflectance). All the bands found in the Directory containing Sentinel-2 bands are listed in the table Metadata. If the Sentinel-2 metadata file (a .xml file whose name contains MTD_MSIL1C) is provided, then Metadata are automatically filled. For information about Metadata fields read this informative page . 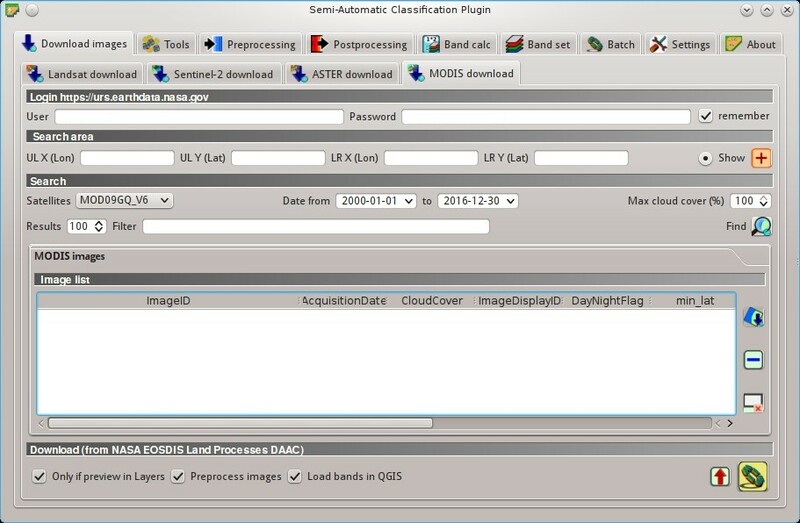 This tab allows for the conversion of ASTER L1T images to the physical measure of Top Of Atmosphere reflectance (TOA), or the application of a simple atmospheric correction using the DOS1 method (Dark Object Subtraction 1), which is an image-based technique (for more information about conversion to TOA and DOS1 correction, see Image conversion to reflectance). 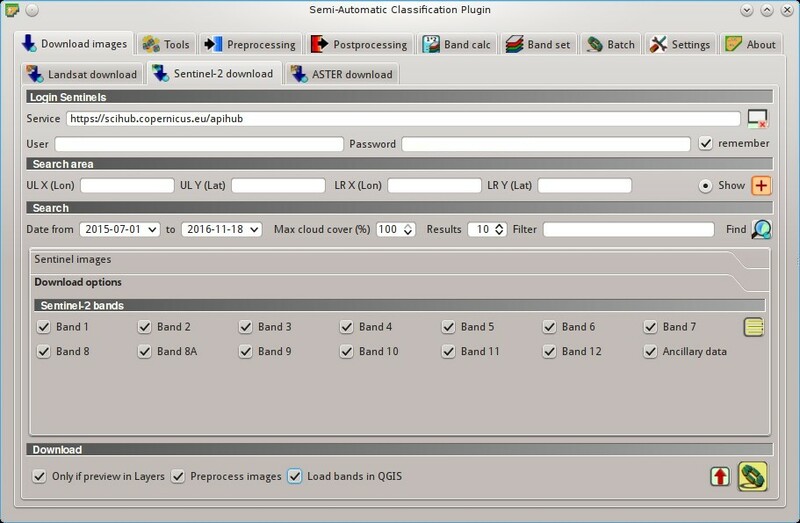 All the bands found in the Select file ASTER L1T are listed in the table Metadata. For information about Metadata fields visit the ASTER page . This tab allows for the conversion of MODIS images to .tif format, and the reprojection to WGS 84. 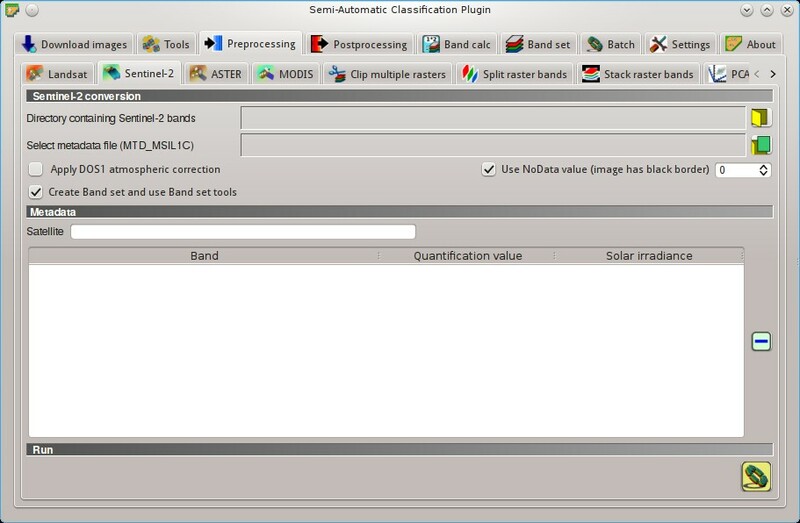 All the bands found in the Select file MODIS are listed in the table Metadata. For information about Metadata fields visit the MODIS page . This tab allows for cutting several image bands at once, using a rectangle defined with point coordinates or a boundary defined with a shapefile. Set the Upper Left (UL) and Lower Right (LR) point coordinates of the rectangle used for clipping; it is possible to enter the coordinates manually. Alternatively use a shapefile. Split a multiband raster to single bands. Stack raster bands into a single file. This tab allows for the PCA (Principal Component Analysis) of bands loaded in the Band set. This tab allows for the conversion of a vector to raster format. 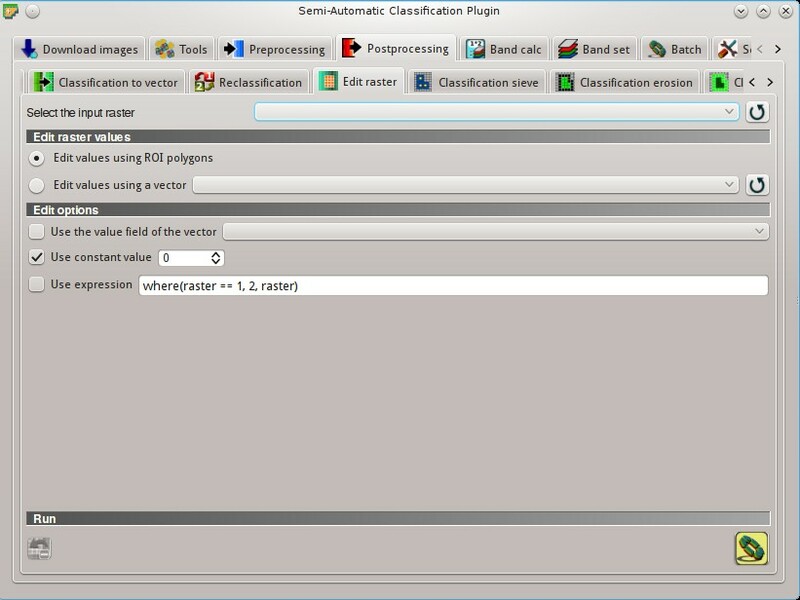 The tab Postprocessing provides several functions that can be applied to the classification output. 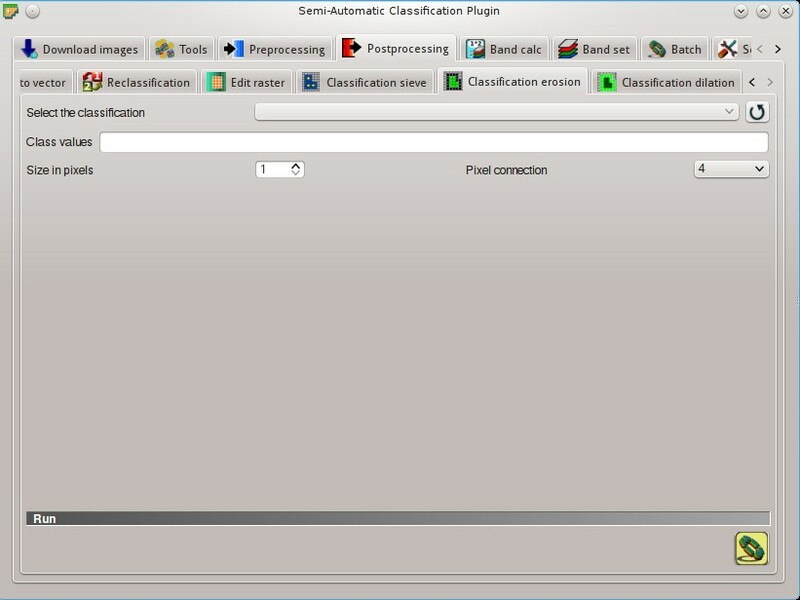 This tab allows for the validation of a classification (read Accuracy Assessment ). Classification is compared to a reference raster or reference shapefile (which is automatically converted to raster). 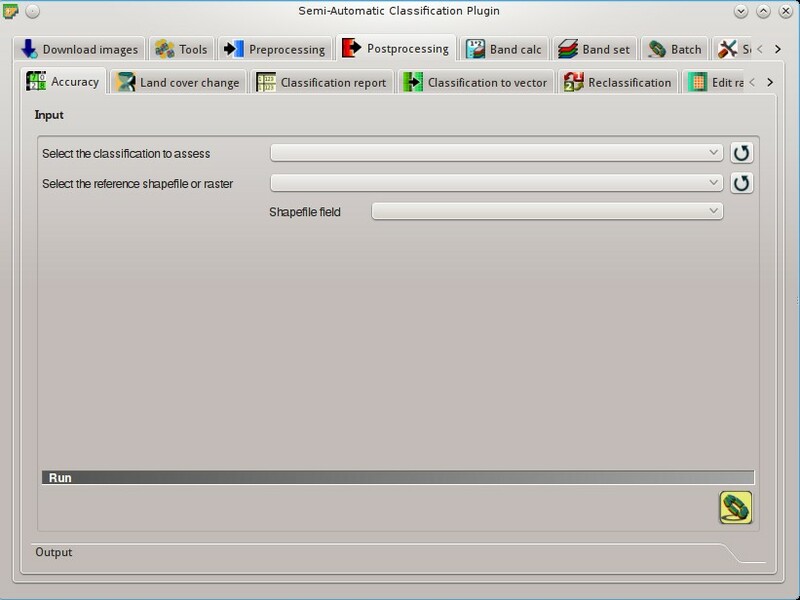 If a shapefile is selected as reference, it is possible to choose a field describing class values. Several statistics are calculated such as overall accuracy, user’s accuracy, producer’s accuracy, and Kappa hat. The output is an error raster that is a .tif file showing the errors in the map, where pixel values represent the categories of comparison (i.e. combinations identified by the ErrorMatrixCode in the error matrix) between the classification and reference. Also, a text file containing the error matrix (i.e. a .csv file separated by tab) is created with the same name defined for the .tif file. The tab Land cover change allows for the comparison between two classifications in order to assess land cover changes. Output is a land cover change raster (i.e. a file .tif showing the changes in the map, where each pixel represents a category of comparison (i.e. 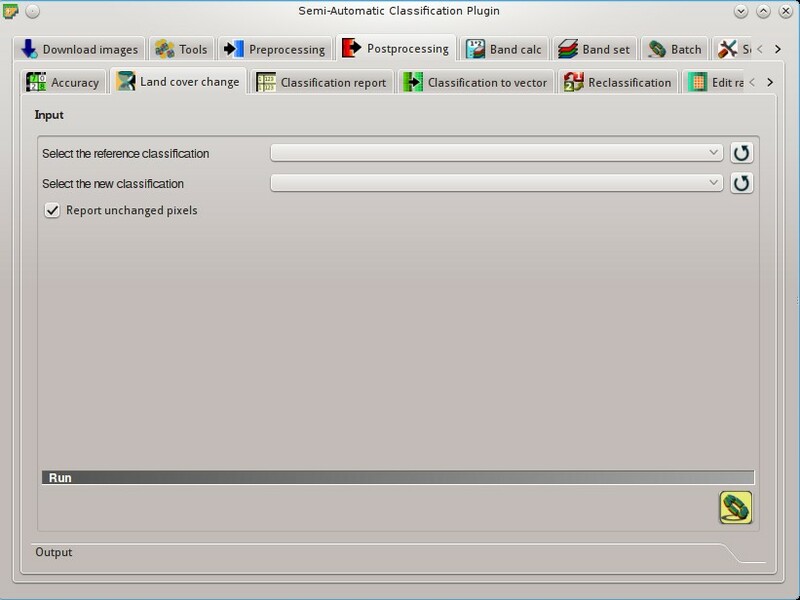 combinations) between the two classifications, which is the ChangeCode in the land cover change statistics) and a text file containing the land cover change statistics (i.e. a file .csv separated by tab, with the same name defined for the .tif file). 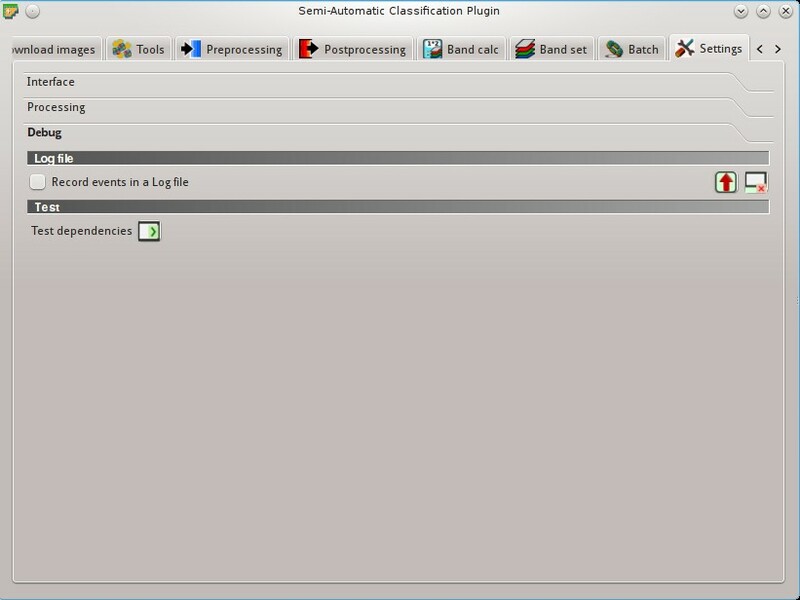 This tab allows for the calculation of class statistics such as number of pixels, percentage and area (area unit is defined from the image itself). 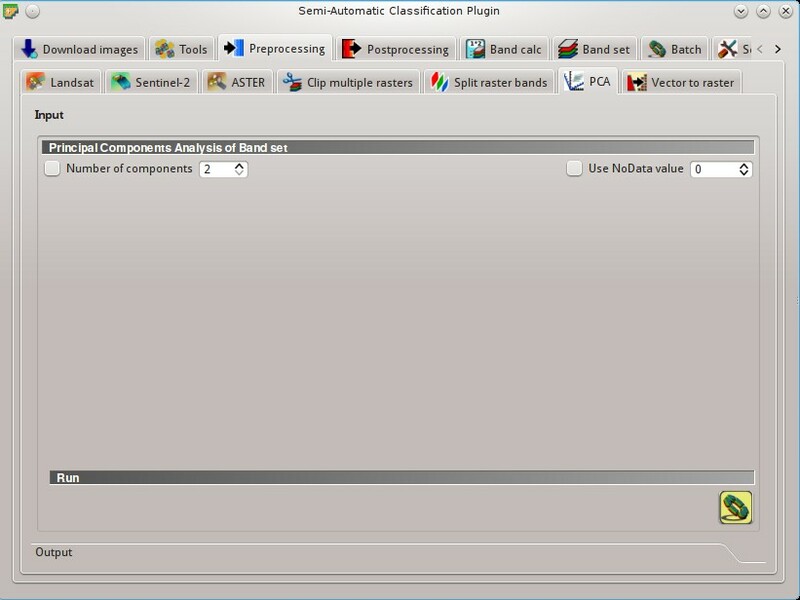 This tab allows for the calculation of a cross classification raster and matrix. Classification is compared to a reference raster or reference shapefile (which is automatically converted to raster). This is useful for calculating the area for every combination between reference classes and classification values. 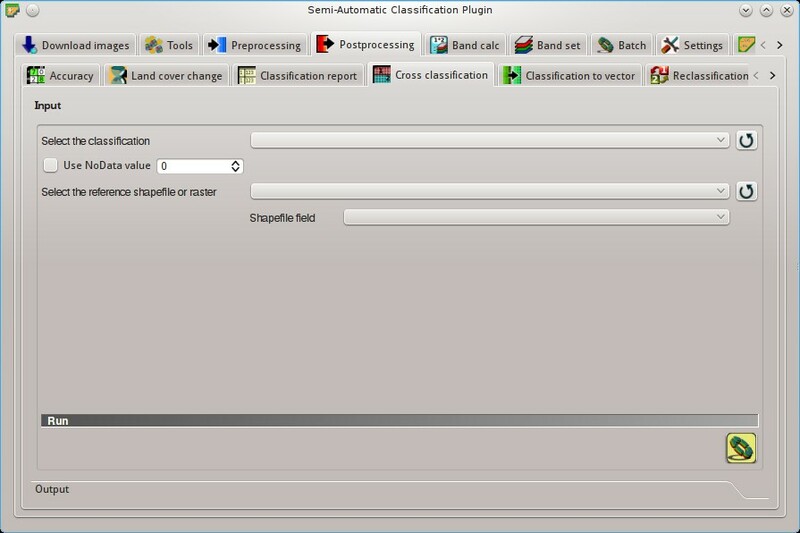 If a shapefile is selected as reference, it is possible to choose a field describing class values. The output is a cross raster that is a .tif file where pixel values represent the categories of comparison (i.e. 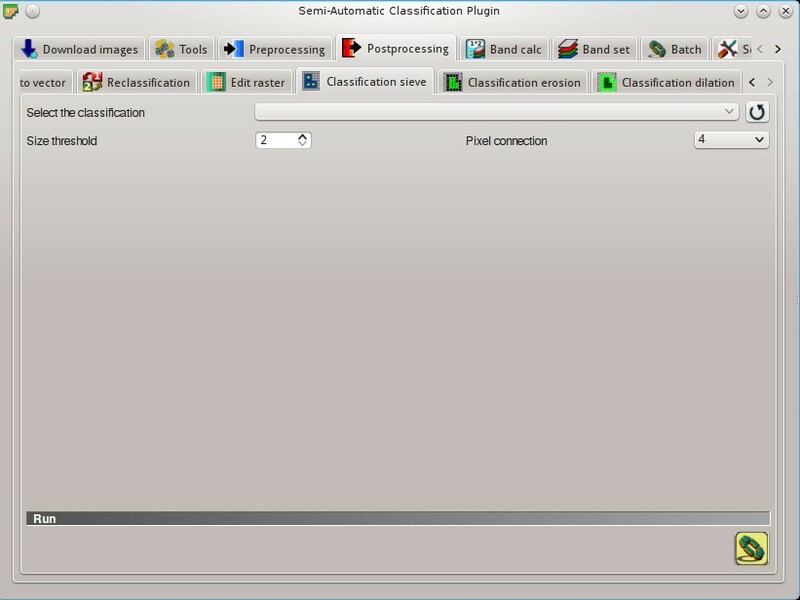 combinations identified by the CrossMatrixCode) between the classification and reference. Also, a text file containing the cross matrix (i.e. a .csv file separated by tab) is created with the same name defined for the .tif file. 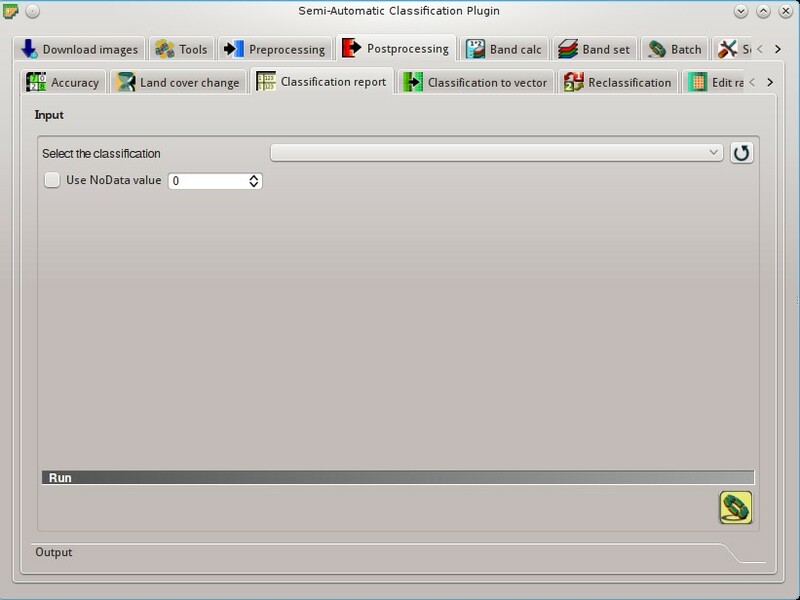 This tab allows for the conversion of a classification raster to vector shapefile. This tab allows for the reclassification (i.e. assigning a new class code to raster pixels). In particular, it eases the conversion from C ID to MC ID values. This tab allows for the direct editing of pixel values in a raster. Only pixels beneath ROI polygons or vector polygons are edited. Attention: the input raster is directly edited; it is recommended to create a backup copy of the input raster before using this tool in order to prevent data loss. This tool can rapidly edit large rasters, especially when editing polygons are small, because pixel values are edited directly. 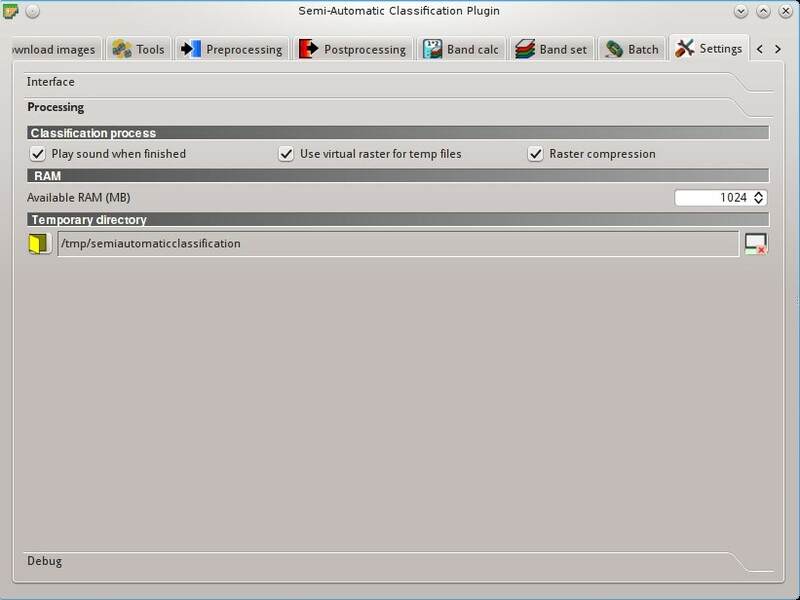 In addition, the SCP Edit Toolbar is available for easing the raster editing using multiple values. This tab allows for the replacement of isolated pixel values with the value of the largest neighbour patch (based on GDAL Sieve ). It is useful for removing small patches from a classification. 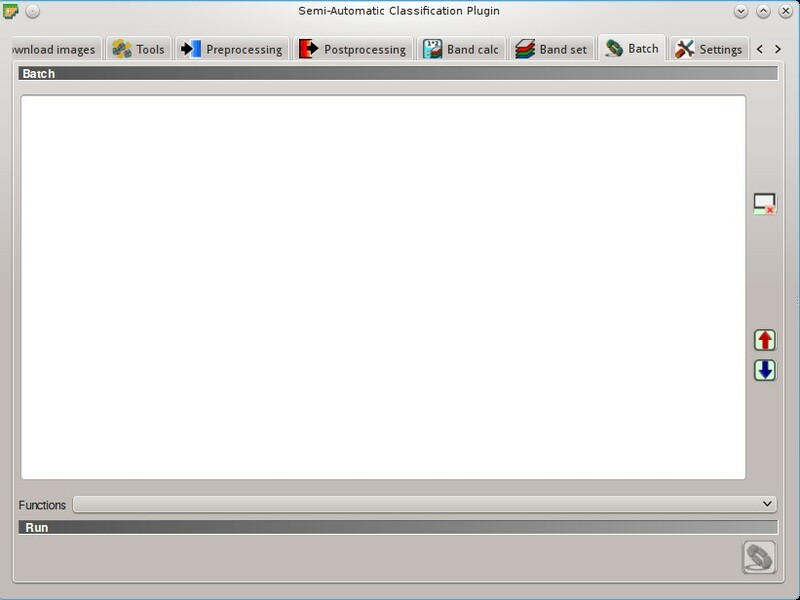 This tab allows for removing the border of a class patch (erosion), defining the class values to be eroded and the number of pixels from the border. It is useful for classification refinement. This tab allows for dilating the border of a class patch, defining the class values to be dilated and the number of pixels from the border. It is useful for classification refinement. The Band calc allows for the raster calculation for bands (i.e. calculation of pixel values) using NumPy functions . Raster bands must be already loaded in QGIS. Input rasters must be in the same projection. In addition, it is possible to calculate a raster using decision rules. Enter a mathematical expression for raster bands. In particular, NumPy functions can be used with the prefix np. (e.g. np.log10(raster1) ). For a list of NumPy functions see the NumPy page . If text in the Expression is green, then the syntax is correct; if text is red, then the syntax is incorrect and it is not possible to execute the calculation. 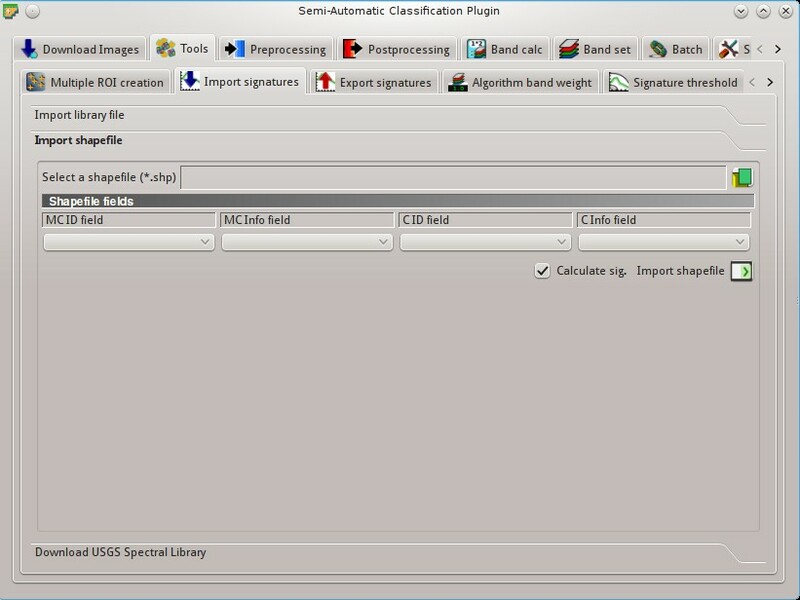 Index calculation allows for entering a spectral index expression (see Spectral Indices). Decision rules allows for the calculation of an output raster based on rules. Rules are conditional statements based on other rasters; if the Rule is true, the corresponding Value is assigned to the output pixel. Rules are verified from the first to the last row in the table; if the first Rule is false, the next Rule is verified for that pixel, until the last rule. If multiple rules are true for a certain pixel, the value of the first Rule is assigned to that pixel. The NoData value is assigned to those pixels where no Rule is true. The output raster is a .tif file, with the same spatial resolution and projection of input rasters; if input rasters have different spatial resolutions, then the highest resolution (i.e. minimum pixel size) is used for output raster. 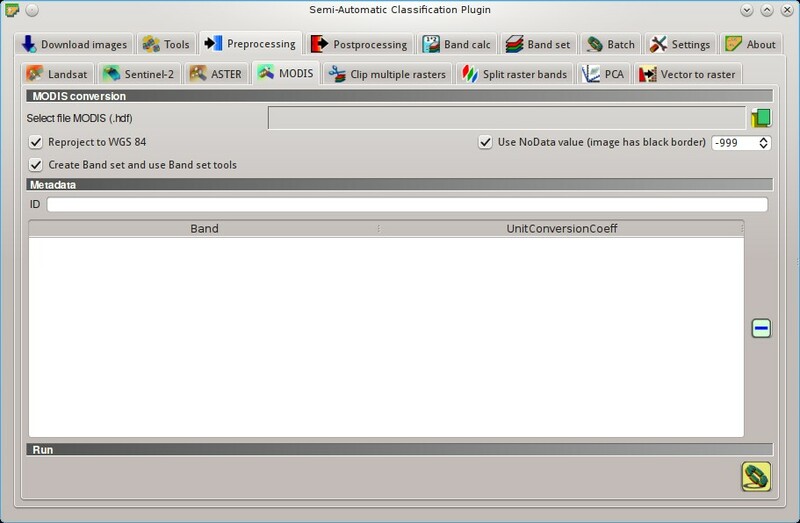 This tab allows for the definition of a set of single band rasters (Band set) used as Input image. The Center wavelength of bands should be defined in order to use several functions of SCP. If a Band set of single band rasters is defined, then the item << band set >> will be listed in the Working toolbar as input image. 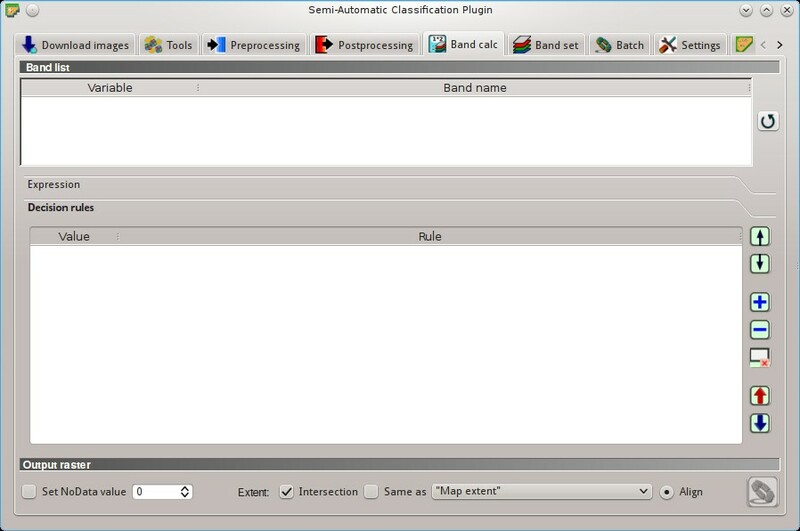 The Band set definition is saved with the QGIS project. List of single band rasters loaded in QGIS. : add selected rasters to the Band set. Definition of bands composing the input image . If the Center wavelength of bands is not defined, the band number is used and some SCP tools will be disabled. It is possible to define a multiplicative rescaling factor and additive rescaling factor for each band (for instance using the values in Landsat metadata), which are used on the fly (i.e. pixel value = original pixel value * multiplicative rescaling factor + additive rescaling factor) during the processing. 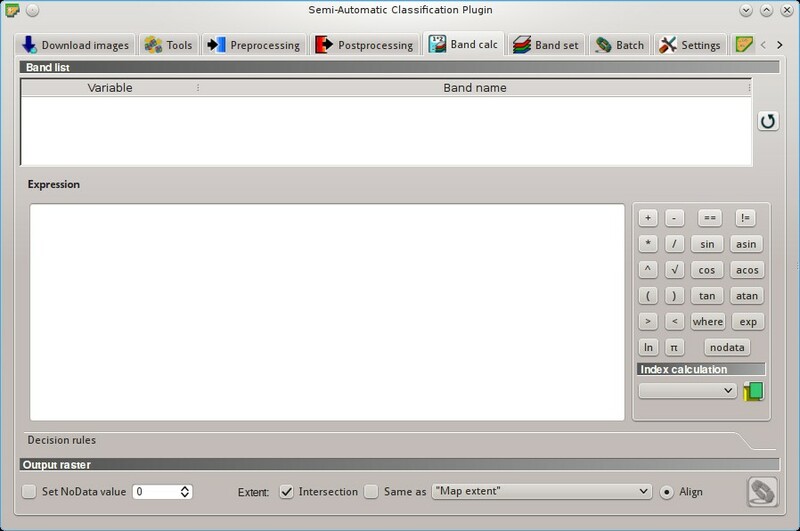 It is possible to perform several processes directly on Band set. 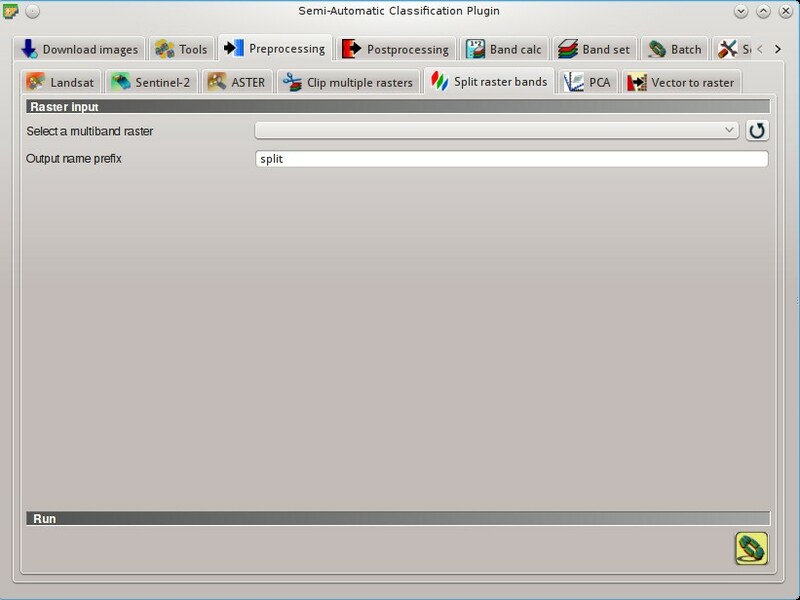 This tab allows for the automatic execution (batch) of several SCP functions using a scripting interface. Options must be separated by the character ; . 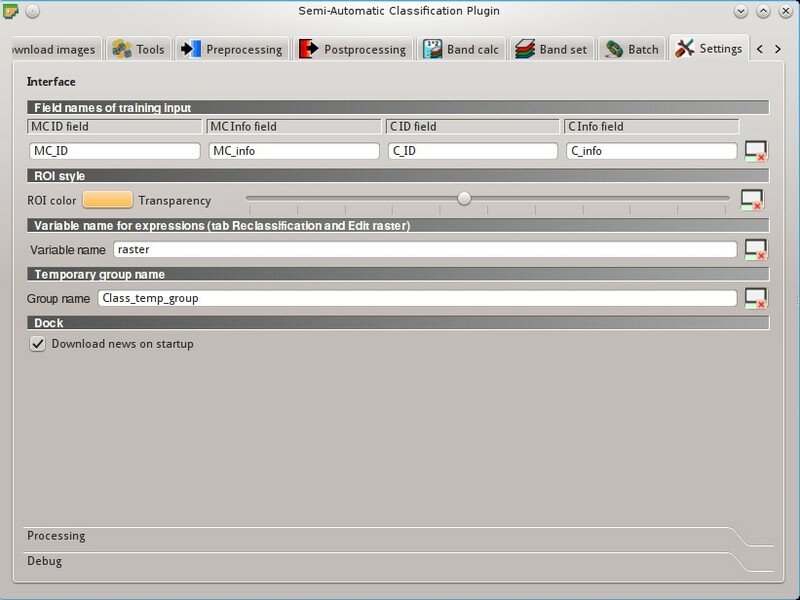 Each function option represents an option in the corresponding interface of SCP; option arguments of type text must be between the character ' ; in case of checkboxes, the value 1 represents checked, while the value 0 represents unchecked. A new line beginning with # can be used for commenting. According to the function, some of the options are mandatory while other options can be omitted from the expression. Option names that contain path require the full path to a file. Some options that require multiple arguments such as lists; lists must be separated by , . If the expression contains errors, the text is red. The tab Settings allows for the customization of SCP. Set the names of fields in the Training input . Changing field names should usually be avoided. Change ROI color and transparency for a better visualization of temporary ROIs on the map. 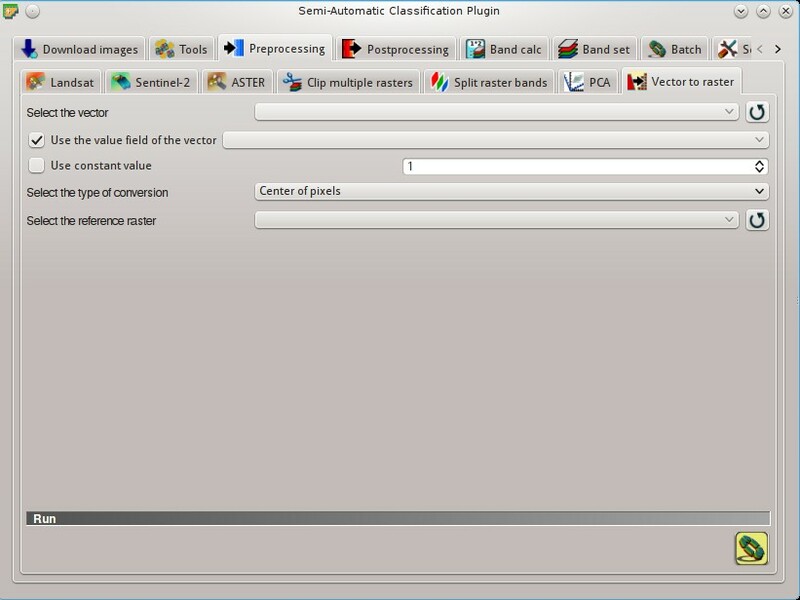 Set the variable name used in expressions of the Reclassification and Edit raster . Set the temporary group name in QGIS Layers used for temporary layers . Debugging utilities for the creation of a Log file (i.e. recording of SCP activities for reporting issues) and testing SCP dependencies. If you found a plugin error, please read How can I report an error? . © Copyright 2012-2017, Luca Congedo.